My mom used to say, "Yeah, that's one of my more brilliant ideas..." when it came to something that she did well. I have been thinking about some of my own, and thought I'd share. Baby Binder: This has been extremely helpful with Benjamin, who was premature, and the fact that we move all over the place. I think his exit instructions have been copied about nine times. It is also useful when they ask questions that no one would have the capacity to remember, "And when was the last time your child was seen for a Hepatitis A vaccination booster?" Well, let me look in my handy dandy NOTEBOOK, because I don't tend to keep that information in my Randam Access Memory! - if I see a set of cute or memorable stamps, I buy a full sheet and stick it in the folder. It's my lame way of stamp collecting. The 50 states suckers me in every time. While at the pediatrician, or dentist, or any specialist my kid has to visit, I grab at least 3 business cards. I tape one to the picture on the cover (I bring my binder to the counter and ask the receptionist for a piece of tape and just do it right there...), and put two in my wallet. One is to give out and the other is for my reference. This is GREAT for when you need to call and tell them you are running late, can't remember EXACTLY where the office is or if you just need to make an appointment between sleep deprivation and laundry. Christmas rotation: This is an idea I borrow from Nicole Peterson-now-Davis (It's how I remember her name in my rolodex mind...). Simply, you rotate who you have each year. 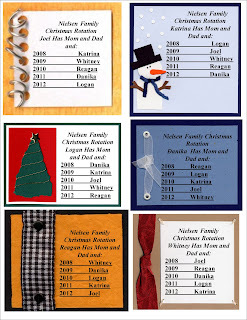 Start with the next sibling down, then rotate the next year to the next sibling down. If everyone does this, you not only have fair rotation of siblings for Christmas, but you also have an entire year to shop for your special relative. It helps to avoid Christmas crunch, and lets you think about that special family for the whole year. This is extremely helpful for kids from large families! Biz: This one is from Miriam and John Hatten. For biological stains (blood and poo and food), this is THE BEST. You get a cheapie $1.50 walmart mop bucket, and soak stained clothes for about 2-3 days. It comes out. The clothes look fantastic, and you can buy white for children again. Fantastic stuff. Amazing stuff. I buy it so that I have at least 2 boxes on hand. I fear for a time when I can't find it. Color coding books: This took about an hour, and has saved my sanity. I love books, I want my kids to enjoy books, but I hate PICKING UP books! I bought a 5 color assortment of electrical tape, and organized the kids library so that all of the books fit. Big tall ones on the big and tall shelf, and little ones on the short shelf. Then, just like the library, we cut a couple of inches of tape, and put them on the lower binder of each book. BAM. Now the kids can put their books away by themselves. I even put a piece of tape in the middle of each shelf so the kids know "Oh, that's the blue shelf." Genius. Cleaning Supplies: It was either Matthew, or the Clean Team who said to have a full bucket on each level of your house, so you're not running around getting supplies from all over. Two floors, two windex, two cleanser, and one day, two vacuums. YES - yes, I hope to be that rich/lazy some day. Let's not make this hard, right? Crap in = Crap out: I've moved too many times to gather much stuff, but I can tell you that it is a marvelous feeling to be able to handle the backlog of stuff. Let it go. If you don't use it, let it go on to bless the life of somebody else. My mom had been saving huge soda cups for about a decade(refills are cheaper! ), but when we took them all out - along with the "very nice" baskets from gifts, plants and sales, it made a mini-village on the kitchen table. We bagged them up, and took them to DI. Now she has a shelf for stuff she had a hard time storing, like her crock pot. Let it go... let it go. Visiting Teaching: Hold a breakfast with all your ladies. Have everyone bring their calendar, and plan 4-6 months in advance when you'll meet. It saves about 14 hours of phone calls, and lets you get everyone on the same day, mostly right after each other. I love it.... great ideas... I love the VT idea.... I'm not sure it would work for me... all my women are inactive and we are lucky to get in when we can. But hey I'm willing to try. 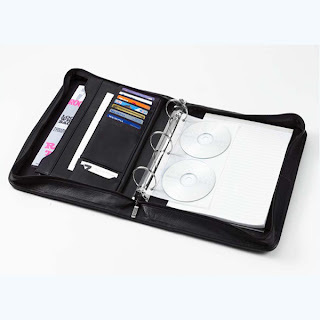 Now seriously you need to market that binder idea. That my friend is genius... especially if you have a child with lots of medical issues. I'm with you on the throw out. I once heard a tv guy say that when he buys a shirt or pants then he throws one of that exact same item out. Shirt for shirt and pants for pants and so forth. The baby binder is a great idea. I've had the same pediatrician for all my kids for all their lives and I keep a pretty thorough baby book for each of them with milestones, etc. but it's a really great idea, especially for people like you who move a lot and if someone has a child with medical problems & lots of doctors. We have a christmas rotation schedule for my family. Ours isn't nearly as cute as yours...it's an excel spreadsheet. But I have the next 6 years planned out (surprising, I know!). I would LOVE to schedule VT that far out. Maybe someday I'll have a cool & organized partner like you so we can actually do that! Brilliant. I have strokes of brilliance but not this many or this many areas. I am lucky if I have my kids height/weight paper from well checks!